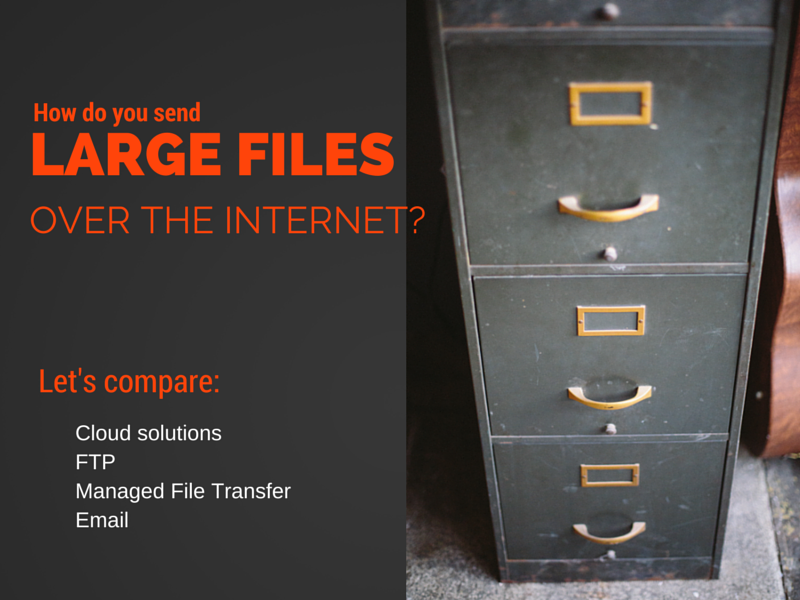 In this post, we'll talk about the best options for sending large files over the Internet. We'll discuss which scenarios each of these options are most suited for. We'll also tackle the major considerations when sending out certain files. Who knows? You just might be using the wrong tool for the job. Today, there are many ways to send large files over the Internet. But I'm sure the first thing that comes to mind is cloud based file sharing, so let's tackle that first. Cloud-based file sharing is a solution delivered under a SaaS (Software-as-a-Service) model. That means, you rent a space in a cloud service provider's (CSP's) servers and pay on either a monthly or annual basis, while the provider takes care of managing the underlying hardware and software. Files can be uploaded through a Web browser, desktop application, or mobile app. The most common examples, which I'm sure you're very familiar with, are DropBox, Google Drive, Box, and countless others. Generally speaking, cloud-based file sharing solutions are easy to use. In fact, its overall simplicity, both from an end user and administrative perspective, is the main reason why they're so popular. You only have to point your user to the solution's website, and he'll be able to hit the ground running. There was a time when virtually all of these solutions had atrocious upload limits. Obviously, those file size limits are now slowly going away. Otherwise, we wouldn't have included these set of solutions in our article. So does that mean, cloud based file sharing now the best choice for transferring large files? Not really. Just like in any cloud-based service, cloud based file sharing solutions store your data in their servers. Sometimes, those servers aren't managed securely or are probably even located in countries where laws on data security and privacy are either weak or non-existent. That can be a big problem. If the data in your files are confidential or covered by laws like HIPAA, GLBA, PCI-DSS, SOX, EU Data Protection Directive, or Australian Privacy Principles, you'll have to make sure your file sharing activities through the cloud service won't undermine your compliance efforts. You'll have to conduct due diligence and determine: where your data is stored, who has access to it, what data isolation practices are in place, whether encryption is employed, and so on. Because you have no direct control over your data and more so the servers, network, switches, routers, gateways, virtual machines, hypervisors, etc. that store, process, and transmit your data, sending big files via a cloud service can complicate your regulatory compliance endeavors. Cloud based file sharing can also complicate matters during processes like eDiscovery wherein you may have to lock down user accounts and restrict access to certain files upon receipt of a legal hold order in order to prevent spoliation. Even if you can request your cloud provider to lock down the user account in question, it will be almost impossible to truly secure all files in question because they may already be scattered across desktops, tablets, and smartphones that that user uses. Furthermore, multiple copies of those files may also be stored in virtual machines/storage devices in the CSP's main data center and off-site backup facilities. Yep. In cases like this, cloud based file sharing won't look so simple anymore. File transfer servers are typically servers that allow users to exchange files through file transfer protocols like FTP, HTTPS, FTPS, AS2, or SFTP. These servers are usually deployed in your own data center and managed by your own administrators. In order to send files you would normally need a client application like AnyClient, which you'll use to connect to your file transfer service and upload/download files with. File transfer protocols like FTP, SFTP, FTPS, etc. are really designed to send big files and multiple files (bulk file transfers). Thus, file upload limits are normally non-existent. You can send large video files, CAD files, image files - practically any type of file. In addition, secure file transfer protocols like SFTP and FTPS are ideal for transmitting sensitive information because they are able to encrypt data while in transit. Data-in-motion encryption is not enough to achieve full security. You also need to encrypt data while it's sitting in your server. That's not all, you'll also need to enforce strong password policies, access control, authentication, etc. In order to harden your file transfer server or make it less vulnerable, you'll need to integrate several other security features that are not included in your file transfer server. If you need to meet strict security requirements, a regular file transfer server won't do. Managed file transfer servers are similar to regular file transfer servers in that they can be used for bulk and large file transfers, and they require a client application like AnyClient. But a managed file transfer server is so much more. This is, hands down, the kind of server you'll want to use for your large file transfer if security is crucial to your business. A managed file transfer server like JSCAPE MFT Server would normally support a nice collection of secure file transfer protocols in addition to a host of built-in security features like data-at-rest encryption, access control, password compliance settings, multi-factor authentication, etc., which can greatly simplify your regulatory compliance initiatives. Another good thing about managed file transfer servers is that they have built-in automation mechanisms that make it easy for you to automate various business processes. So if the large file you send is part of a supply chain process, that's going to simplify a lot things for you. Read our articles on business process automation to better appreciate the value of automated file transfers. Lastly, if your file needs to traverse vast distances (e.g. across the globe) and you want it to arrive as fast as possible, certain managed file transfer servers support accelerated file transfer protocols that can cut down transmission times considerably. Just like regular file transfer servers, managed file transfer servers need to be administered by your own IT staff. Unlike cloud based solutions, you will need to assign someone to configure, manage, and maintain it. But then again, if data security is a major factor for you, I'm sure you wouldn't have it any other way. In fact, because you always have full control over your managed file transfer server, it's going to be much easier to implement a legal hold and comply with eDiscovery mandates. Of course, I don't mean ordinary email. I'm referring to ad hoc file transfer, which combines the familiarity of email with the security and reliability of managed file transfer. Through an ad hoc file transfer service, you can send large files through email using a common application like MS Outlook. 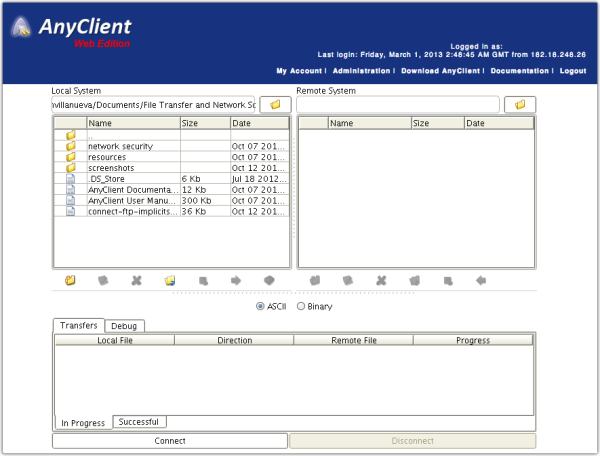 End users might find file transfer clients like AnyClient intimidating. That's just because they're not used to it. But by providing your users with an interface they're very familiar with (like email), you can speed up end user buy-in. Ad hoc file transfers are usually carried out via HTTP or HTTPS. So if you prefer other file transfer protocols, for whatever reason, then this might not work for you. JSCAPE MFT Server comes with a free, fully-functional edition, which you can test drive. Download your copy now.